>In Japan, cell phone games seem to be allot more popular than here. 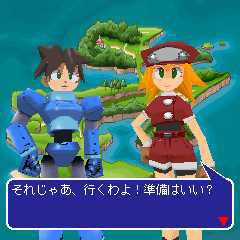 And none other than your hero and mine - Rockman - has starred in a great deal of his own cell phone games. Here's a comprehensive list of all the games Rockman has appeared in on the cell phone via i-mode / Java / keitai or .... whatever. >Some images were shrunk by Capcom when advertising .... and some are from different versions (including, quite possibly, beta versions), of the cell phone games. The larger screens with more NES-like graphics come from a 256K version of the game and the screens with more simplistic graphics are from a 100K version of the game, for phones with less memory. Click here for additional images of the cell phone games! コブン Watch Kobun - Has different motions at different times. When the alarm comes on, Tron appears. コブンが飛ぶん？ - Kobun Flies? - You the propeller attached to your head to clear the stage. There's a christmas version of the game with graphics changed where appropriate. コブンが飛ぶん？Xmas - Kobun Flies? Xmas - Gee ..... what ever could this be about? 跳べ！ロックマン - Jump! 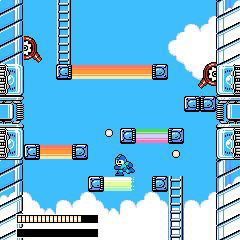 Rockman - Jump over obstacles to rescue Roll! Download Jump! 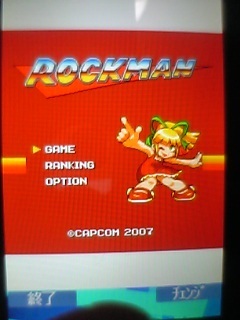 Rockman! Apparently you need to download the PC suite from the nokia website, get a data cable or a pc with an Ir connection to sync the .jad file contained within the zip and voila. I am speaking about Nokia phones of course. How to install for other phones ..... no clue. This zip includes sprites for al;l the characters, so that's a bonus for non-cell users! Swordkirby from my forum has written a small reveiw of the game. This game is simple,addictive and fun. 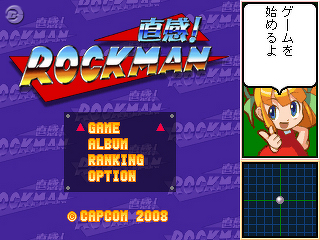 The 'about' says Rockman Version 1.02 C capcom. 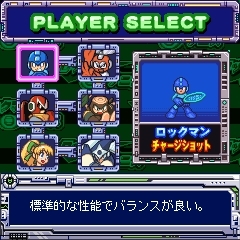 The icon has a head shot of rockman, looking like the 8/9one. The game one looks really funny. Sorta like a cross between the 5 and 7 one. 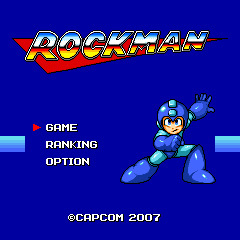 The start screen has rockman jump,which reminds me of the start screen for of one NES game. おしおきコブン - Tide Coming - After so many failed missions Tron decides it's time for punishment! Use timing to avoid the deadly weights! 組み立て コブン - Kobun Assembly - Complete each Kobun on the assembly line! Make one mistake and it's history, though. 15パネル - 15 Panel - A puzzle game featuring the characters of Rockman Dash! 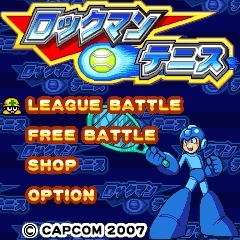 ロックマン　バグスイーパー - Rockman Bug Sweeper - Just like the computer game the numbers correspond to enemies. ロックマンパニックファイア - Rockman Panicfire - Avoid Fireman and his flames! Get to Dr. Wily and beat that mad scientist! Fireman moves in the opposite direction you do. There was a free trial version of this game available in "July". ロックマン DASH ゴルフ - Rockman Dash Golf - A (duh) Rockman golf game! Each player has different strengths and weaknesses. ロックマン - Rockman / Megaman- A complete copy of Rockman 1 and more! Boasting a new "capture mode" players can play against each other and compare scores. This game also is being released for english cell phones. 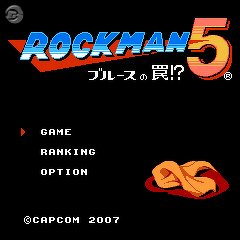 ロックマン ＧＰ - Rockman GP - Like Rockman Battle and Chase this is a racing game where you can attack other racers. 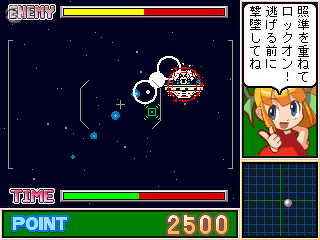 ロックマン　スペースレスキュー - Rockman Space Rescue - Using inertia and your jet engine can you help Rockman save all the astronauts? ロックマン ロケットクリスマス - Rockman Rocket Christmas- Pretty much Rockman Space Rescue only edited to give presents instead of saving astronauts. 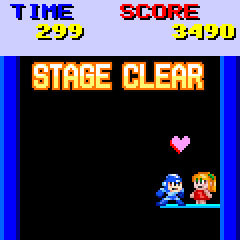 ロックマン スロット - Rockman Slot - Don't let Wily capture Rockman with his slot machine! Hitting the big eyes mean big trouble for Rockman. 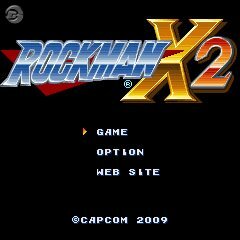 ロックマン 2- Rockman 2 - The entire game on your cell phone! The alternate select and title screens are probably from an earlier version. ロックマン ピンボール - Rockman Pinball - A Rockman Pinball Game (duh). ロックマン エグゼ ファントム オブ ネットワーク - Rockman EXE Phantom of Network - The following information is ripped straight from our hosts at Planet Megaman .... including summaries for each chapter. The real world parts are just selecting options, but the net part plays just like in the game (except with up-down settings instead of vertical). You can slot in chips and battle exactly like in the regular series. New navis include Hatman. 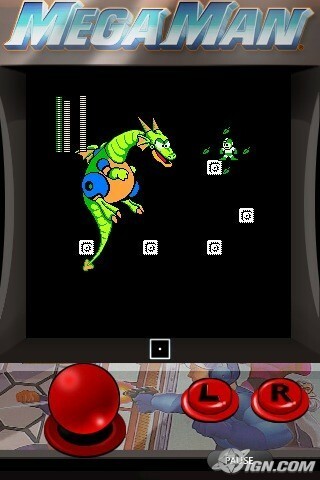 The graphics seem identical to the game with the phones compressing the graphics when displaying (whoda thunk). In addition to the main scinarios, there are several side quests as well. The story as of now is rather basic, but follows thusly. In the year 200X everything is connected within a network. Of course with the rapidly increasing technology comes rapidly increasing net crimes. There are those who work with their Net Navis to stand up against viruses and bad programs, as such our human/Net Navi protagonist team: Netto (Lan) and Rockman (Mega Man). However, a new threat is sneaking up to their origin. 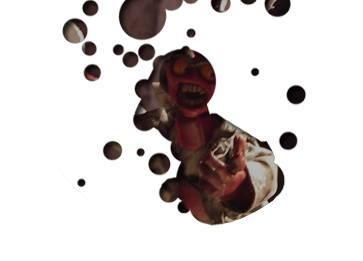 The malicious being is resurrected from their past. In Densan City, Akihara Town, resides the sixth grade elementary school student Netto Hikari. Although his school studies are a little poor, his virus busting skill is top notch. His Navi Rockman is his best friend. After leaving school one day, Meiru (Mayl) asks Netto to check on her PC which is seemingly in bad condition. 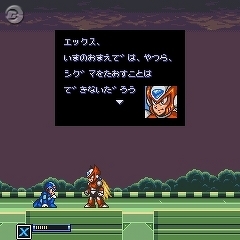 Netto plugs Rockman in, and in far into the system Rockman discovers a mysterious ball of light. The ball of light transforms into the figure of Fireman who had been defeated before, and attacks Rockman! Chapter 2: Hotly Burning Heart! After talking to his father about the incident of the ball of light at the science bureau, Netto goes to school to turn in some forgotten homework. There he meets Mr. Hikawa (Dr. Froid) of the waterworks bureau. He explains that while the water service equipment was under maintenance, an accident occurred causing the cyber space of the equipment to freeze. The exit is frozen, and it is impossible for Iceman to get out. Netto and Rockman head off to rescue him. Rockman is plugged in to find the cause of the trouble, and what he finds at the end of the cyber space is...! 3) Net Battle Tournament Opening! With gratitude for fixing her PC, Meiru (Mayl) invites Netto (Lan) to go see a magic show with her. However, while they're at the show, trouble starts to brew in the tent cyber world (wow, even tents have cyber worlds?). Fearing a connection with a series of incidents, Netto and Rockman come forward to the solution. When they plug-in they do not find the ball of light as expected from earlier, but rather they find Hatman. Although Hatman is the Navi of Shuuichi, who is a new classmate of Netto's, could he really be related to the incidents? Shuuichi Eboshi: The son of Mr. Hat and operator of Hatman. Because of his father's work, he moves to the same school Netto attends. Because his father is always busy and doesn't care much, Shuuichi is often feeling loneliness and disatisfaction. Hatman: Shuuichi's Navi. He is skilled with attacks following a majic motif, being able to pull roses and swords out of thin air and producing things from his silk hat. Mr. Hat: This famous magician is Shuuichi's father. He is always on the move in order to entertain people everywhere. 6) Electrical Interference by Electronic Jamming! A grand investigating initiative on behalf of the science bureau is started to find a solution to the incidents. Netto also receives direct request from his father. 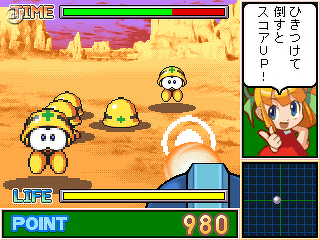 Netto and Rockman go into the mobile area where electronic jamming has been flying about wildly. In the deepest section of the area they encounter the mysterious Navi - Jammingman. Virus outbreaks are occuring in great quantity all over the world, leaving the cyberworld in a paralyzed state. 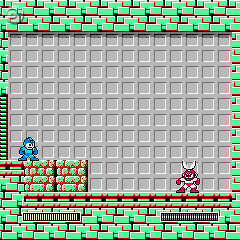 Amidst all this, Netto and Rockman go through a hole in the cyberworld, and press on the exploration. The destination they arrive to is a mysterious, monotone colored cyber space. What's expected here...? A mysterious voice echoes to them. Finally Netto has reached the true mastermind of the incidents! 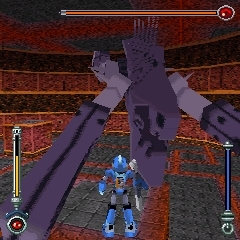 Netto and Rockman come to find the inciter of the incident's true identity. Netto's father now resorts to participation request strategy, for the sake of protecting peace, one large plan involving net battlers around the world is started. Recognizing Netto's ability for battle, many net battlers come to him cooperation, and the final battle begins! 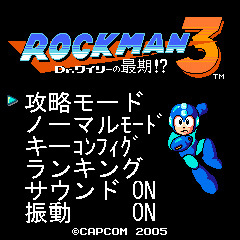 ロックマン 3 - Rockman 3 - The Entire game on your cell! Better than the tiger version! カプコンギャルのマインドパズル - Capcom Girls Mind Puzzle - Thanks to Quickman for figuring out the title fully (as Bablefish had a hard time with it). 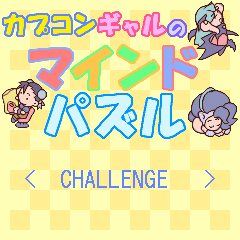 This is a Puzzle game featuring Capcom Girls. 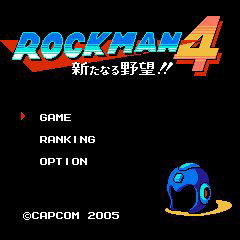 ロックマン 4 - Rockman 4 - The entire game! Same as the previous three! ロックマン エグゼ レジェンド オブ ネットワーク Rockman EXE: Legend of Network - Another Rockman EXE game on the cell phones. Alot less is known about this one, but there's new navis along with this game just like the old one. 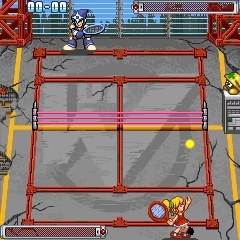 ロックマンテニス Rockman Tennis - Features Rockman, Blues, Roll, Cutman, Woodman, and Shadowman. "Rule “1 games, has been based on the official rule such as 1 set acquisitions with 2 game preoccupation with 4 points" As you might expect, each character is capable of a super move. In addition to a league mode and a free battle mode there's also a shop which can do things like increase speed. 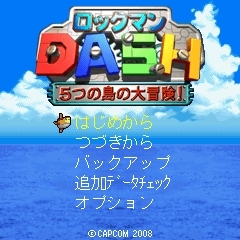 ロックマンDASH 5つの島の大冒険！ Rockman DASH Five Islands Great Adventure! - Rock and Roll explore ruins on five islands for treasure. They must avoid traps and fight the Bonne family. 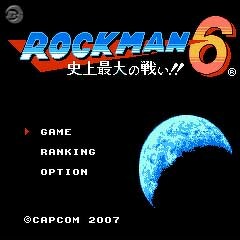 ロックマン6 Rockman 6 - The last NES game is now mobile! So, what about the gameboy series? Get on it, Capcom! 直感！ ロックマン Intuition! 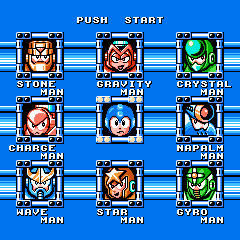 Rockman - A mini-game collection. Mad scientist Dr., Wily has escaped and challenges you to 12 games. Players can compete country wide for the best score. 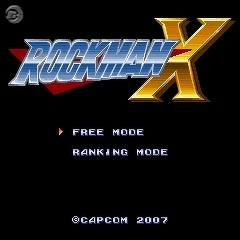 ロックマンX2 Rockman X2 - I remember when this game was unemuable thanks to that C4 chip. 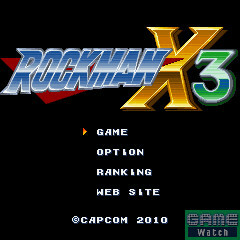 ロックマンX3 Rockman X3 - The last SNES X game now on the cell phone. 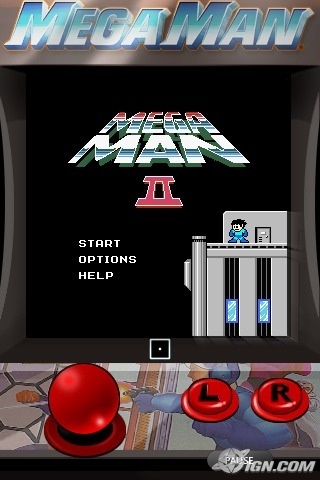 Megaman 2 (iPhone) - I don't know exactly how much of this is different from the standard MM2 release, but it this version uses the touch pad to create it's own controls. 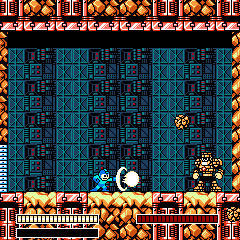 Megaman Rush Marine - No Robot Masters, weird fish enemies, and scrolling / shooting action mark this as one of the more unusual Megaman titles. Reports state that it feels more like a homebrew game than one made by Capcom. Evidently Wily's drilling for oil and it's causing earthquakes.